Venice was one of the most important cities in Europe in the late Middle Ages and the Modern era, when it formed an independent state which controlled trade across the Mediterranean and towards the Levant. A myth of Venetian uniqueness has been cultivated by local historians and international specialists which has always attributed to the town on the lagoon an innate and unique vocation for political autonomy and trade. This in fact is only partially based on historical facts. Although some exceptional elements are observable – such as the local government of the Venetian public assembly (placitum) and the amphibian nature of the settlement – these elements have been much overestimated at least as far as the Early Middle Ages is concerned. In the 9th and 10th centuries the apparently novel appearance of Venice on the Italian political scene and the associated emergence of the Venetian public assembly presided over by the duke has numerous parallels in other parts of Italy where several urban communities, mostly represented by their bishops, started to act as social and political entities at the same time. In addition, the region around Venice demonstrated its own economic vitality with other towns competing for the control of the Adriatic sea well before the 9th century by engaging in maritime and artisanal activities remarkably similar to those of other settlements in Northern Europe, which archaeologists such as Chris Loveluck and Will Bowden usually call emporia. Moreover, some recent reconstructions suggest that the rapid growth of Venice in the 8th and 9th centuries can be explained by the conjunction of the contemporary expansion of the Carolingian empire which increased demand for luxury goods with Venice’s special location on the sea near a great river delta (the Po). 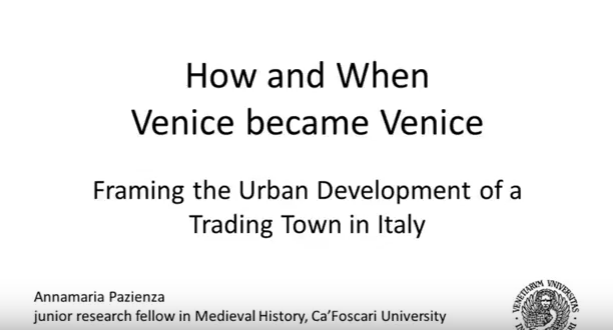 Although it is likely that the convergence of both these factors had played a major role in the sudden development of the city, it is often forgotten that Venice shared the same ecological position and the same economic system with many other trading towns at least in this earlier period. These facts pose other challenges to the traditional triumphalist explanations. Why did Venice enjoy a more durable success in a longterm perspective with respect to other towns? What exactly made the difference in the Venetian case? Was it mere coincidence that Venice was the seat of a political authority, the doge, whereas the other emporia were not? Was the fact that this authority was secular (a duke) rather than religious (a bishop) as elsewhere the key point? The paper will seek to answer these questions by analysing the case of Venice in a comparative context and in the light of both archaeological data and written sources, by suggesting for the city, before 1050, typical rather than exceptionality in terms of population size, accumulation of wealth and socio-economic development.